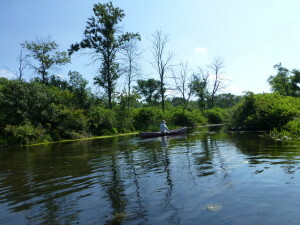 Friends have three scheduled paddles this summer on the Mukwonago River. These require your own canoes/kayaks and personal flotation devices for each person. Eagle Spring Pub has boats for rental, contact them directly 262-594-2337. Each person attending will be required to sign a liability release waiver. Remember adequate water and snacks for your party. RSVP to Friends. Put into Mukwonago River at the Kettle Moraine State Forest – Southern Kettle Waters (former Rainbow Springs golf course) and take out at County Highway I. Estimated paddling time 2 to 2.5 hours depending upon water levels, wild rice growth and obstacles along river (expect to portage around some obstacles). Paddle route – Pickerel Lake & Mukwonago tributary. This route has been changed. Put in at Townline Road just north of Camp Alice Chester at the river crossing. Parking and shuttle will be available to Camp Alice Chester. Paddle in unnamed tributary from Townline Road into Pickerel Lake. Possible post paddle hike of the Pickerel Lake Fen. Educational interpretation of a fen also possible. Put in at Eagle Springs Lake DNR boat launch behind Eagle Springs Pub. Paddle across Eagle Spring Lake and into Lulu Lake and back to boat launch. Rental canoes available from the Eagle Spring Pub, 262-594-2337.